Use your iPhone’s Airplane mode when you fly. The iPhone’s Airplane mode lets you take advantage of the iPhone’s built-in iPod (among other capabilities) while temporarily turning off its phone, e-mail, and Internet functions. To do so, merely tap Airplane Mode on the Settings screen to display On (rather than Off). This disables each of the iPhone’s wireless radios: Wi-Fi, Edge, 3G (if applicable), and Bluetooth. 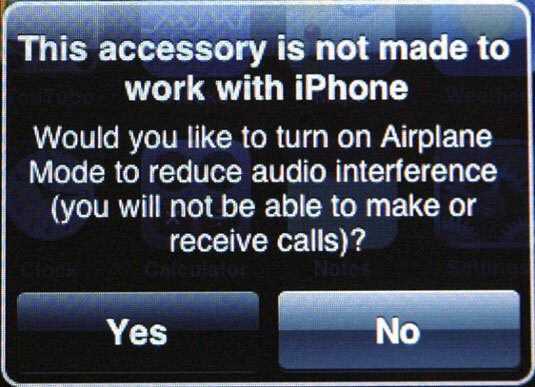 If you plug the iPhone into an iPod accessory that isn’t necessarily compatible because of possible interference from the iPhone’s wireless radios, it offers to turn on Airplane mode for you, as shown here. Answer yes to this question to try and eliminate static. While in Airplane mode, you can’t make or receive calls, surf the Web, watch YouTube, or do anything else that requires an Internet connection. The good news is that Airplane mode keeps your battery running longer, which is particularly useful if the flight you’re on is taking you halfway around the world.